26/2/10 – Acquisitions – Sainte-Ménehould, Musée d’Art et d’Histoire – Closed since 2004 due to security problems, the Musée de Sainte-Ménehould, a small town which has gone down in history as the place where Louis XVI was recognized during his flight from France before being arrested in Varenne, is undergoing a refurbishment and should reopen very soon. The town has decided at this time to institute an active acquisitions policy, notably for landscapes. 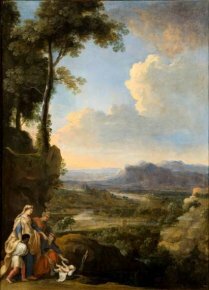 Thus, it has purchased on the London market (Moatti Fine Arts), five 17th century French paintings which were seen at the Maastricht Fair in 2009 for 140,000€ (ill. 1 to 5) . These panels representing the life of Moses are most likely parts of a décor and have been attributed, in all probability, to Henri Mauperché, one of the artists who founded the Académie and who has left few known works. 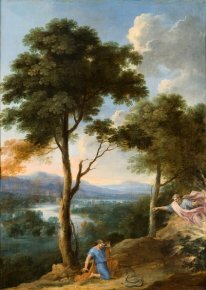 Mauperché produced several decorations : in 1646-1647 he worked on the Cabinet de l’Amour at the hôtel Lambert where he painted three compositions of which only the Landscape on the Bridge remains, at the Louvre ; in 1660, he executed eight landscapes for Marie-Thérèse’s apartment at the Louvre (all lost) and in 1663-1664 fourteen large landscapes of which only two have been found and are held at the National Gallery in Sofia . Based on current knowledge, no ties have been found between these paintings and the décors. This might be a series painted for another commission. 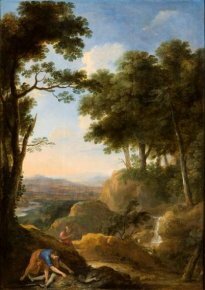 In 2008, the Musée in Rennes had also acquired a landscape by this artist (see news item of 14/5/08). Fifty percent of this amount was provided by the Fonds du Patrimoine and twenty-seven by the region, via the Fonds Régional d’Acquisition des Musées. See Nathalie Coural, Les Patel. Paysagistes du 17th century, 2001, Paris, Arthena, pp. 83-84.